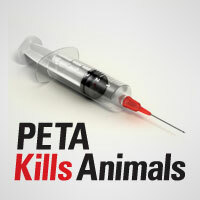 Is PETA SLAPPing the Internet? People for the Ethical Treatment of Animals (PETA) doesn’t like it when other people — including us, through our PETA Kills Animals project — point out that the world’s most notorious animal liberation group kills large numbers of dogs and cats in its Virginia animal shelter. Last year, state records show that PETA killed nearly 90 percent of the pets in its care, bringing its total body count to over 29,000 since 1998. People on the web are often wrong, like some of PETA’s claims against animal agriculture. And we get why PETA would be peeved that people are spreading false rumors about them — the animal liberation movement has spread some false ones about us. Factual accuracy isn’t the internet commenter’s strong suit. So how did PETA respond? Not by announcing that it would cease its killing of animals, that’s for sure. Instead, PETA called its attorneys and filed a petition against the Huffington Post, demanding the personal information of certain anonymous commenters. The tactics resemble those of a Strategic Lawsuit Against Public Participation (SLAPP), in which a corporate entity (that can afford expensive lawyers) sues or takes steps toward suing a speaker (who probably can’t) to chill speech against the corporate entity. The commenters are likely just Joe Schmos, while PETA has an annual budget of over $30 million, so it can afford creative and expensive attorneys—just as it could afford to find more homes for adoptable pets, if it so desired. Even if PETA’s claims have merit as to the particular statements cited in this case, the suit may be designed to chill those who wish to oppose PETA publicly. PETA’s message is: We won’t just baselessly sue on behalf of killer whales, we’ll now take steps toward suing no-name internet commenters’ pants off for getting their facts wrong. Either way, this shows how damaging the revelations that PETA kills dogs and cats are to the group. We know we won’t be silenced. The truth is that PETA kills hundreds of dogs and cats every year. It’s there for anyone to see, in black and white on government records.